Rob Nicholas has been running trips to both Argentina and Chile for 20 years and he has been a full time guide on the Housatonic and Farmington Rivers in Connecticut for 25 years. Each year he hosts three trips to Patagonia and he has fished with many lodges and outfitters in both countries. There are few that have as much knowledge or experience fishing in Patagonia and he considers it his home away from home. 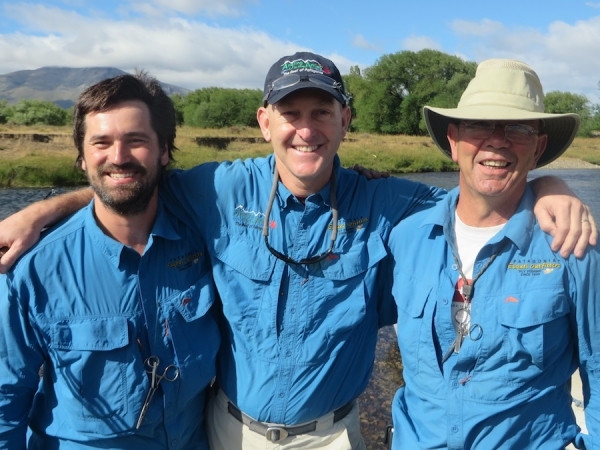 In 2010, Rob became the primary contact for anglers seeking to fish with Esquel Outfitters. -Year after year (since 1998) I catch more fish, have better dry fly fishing, and catch the largest trout while fishing with Esquel Outfitters. There have been years when this is not the case but most years they out perform all others! -Marcos is organized and handles all the logistical parts of a fishing trip better than any other outfitter I know of. -The client is always taken care of and always put first. I have never seen Marcos take someone fishing to a place because it is easier for him or his guides. -I like to fish in different areas using different techniques. Esquel Outfitters has great diversity built into every itinerary. -El Trebol lodge feels like home to me. It is charming, rustic and by no means pretentious or "commercial" feeling. You are treated like a friend, not just another "guest" of the lodge. -Sometimes things go wrong in Patagonia. Rivers can blow out from rain, volcanic eruptions, earthquakes broken down cars, mud slides, fuel strikes, and so on. When this happens, Marcos just deals with it. He does not complain and often the client never experiences the problem, because he somehow just works around it behind the scenes. No excuses are made, we just go fishing and have fun. Period! Jorge, Rob & Marcos getting ready to float the Chubut. Poor trout!